The next day at 4am, I woke up early to catch a bus to Hue. I hadn’t booked a place to sleep but just stayed at the hostel where I got dropped off. After showering and organising washing, I explored Hue. 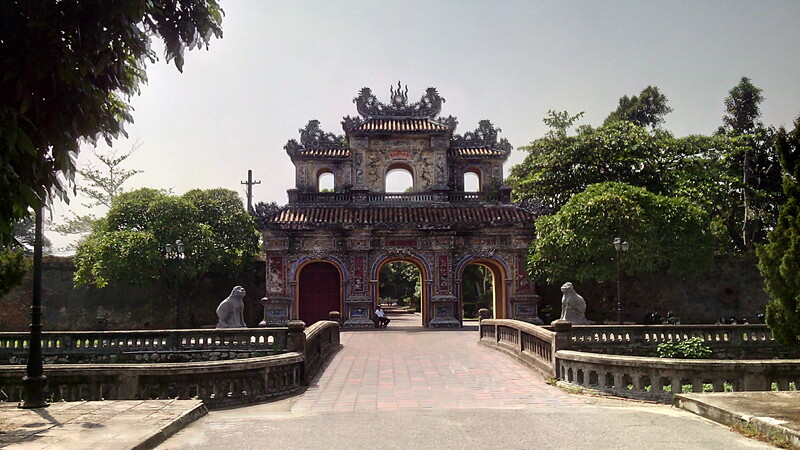 Hue is a small city with no much going on. I walked around the imperial city and Citadel area, seeing different gates and palaces. One thing that is starting to annoy me about Vietnam is the bike drivers and other seller constantly pestering me. I’m saying ‘No, thank you’ but they just keep following me. It’s driving me insane. For lunch, I ate Hue speciality food: rice flour rolls filled with tofu and vegetables and a peanut dipping sauce. During the afternoon, I decided to search out a blind massage place. There are little rooms where a blind person does an hour full body Vietnamese massage for 60,000 dong (£2) and the proceeds help them. It was a mission to get to and difficult to find but it was totally worth it. I was such a good massage. However, it was slightly awkward as I didn’t know if I needed to remove my clothes and I didn’t understand that she wanted to sit up with the lack of English. I enjoyed a Vietnamese coffee before relaxing at the hostel. Later on, I met up with one of the English girls I met in Laos for dinner, where I consumed more Hue specialities: crispy egg pancake and rice flour with shrimp paste cooked in a banana leaf. As I was feeling exhausted and a cold was setting in I had an early night. The following day, I caught up with an American girl I met in Phong Nha. The one thing I love about travelling is that you meet loads of people, most doing similar routes so you just bump into them in different cities. In Vietnam, traveller are either going north to south or vice versa. We got recommended to go around this market, which was a huge disappointment. It had random things like raw meat, pots and even live chickens in cages. It was dirty and more of a local market. After, we relaxed in a coffee shop with a mango shake before hiring out a motorbike. Did you visit Hoian as well? I like Hue and its food but I think there is not much to do though. Have a good time!! I loved Hoi An – such a pretty, unique town. I totally agree with you about Hue. Thank you!